I'm so happy to share that the lovely Judy and Karen at Sew Sisters have partnered with me here at Poppyprint! I first got to "know" their manager Carol a year ago, when I participated in their Kona Club blogger tour of free tutorials, all using gorgeous Kona solids. By way of introduction, Sew Sisters is a Canadian (yay!) quilt shop dedicated to all things quilting. For the past decade, they have offered Canadian quilters great quality fabric, notions, books, kits and patterns, both in the bricks & mortar store in Toronto, as well as online. A customer favourite is the Sale Section where you can find 100's of bolts of fabric for only $7.99/metre! During a quick scroll through, I spied Thomas Knauer's Asbury prints on for $7.99 as well as this cute low volume print, Jeni's Color Me Retro for only $6.99 and this super fun shark print that would make fabulous boxers or PJ pants for boys! I love their shop motto "at Sew Sisters, we believe that you should buy fabric, not postage, so we offer great rates on shipping within Canada". They are true to their word! There's a weekly giveaway on their Facebook page, so head over there and Like the page so you don't miss those! 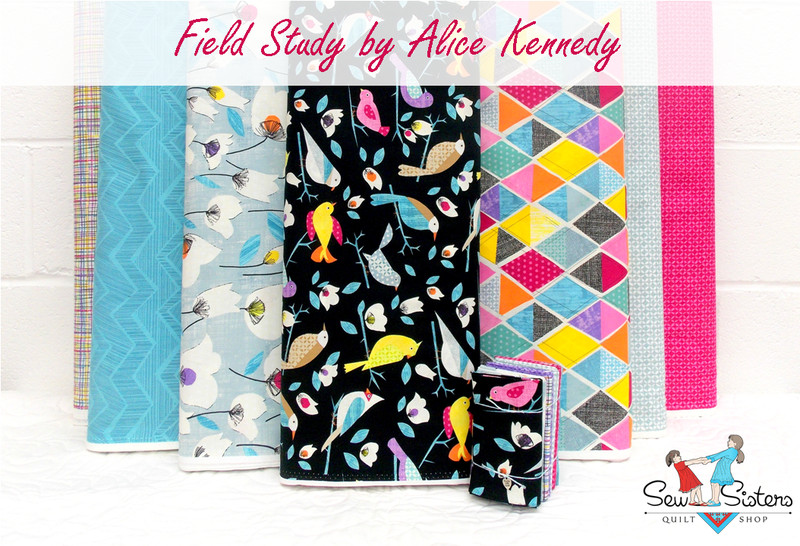 To celebrate our new partnership, Sew Sisters is going to send one of you a FQ set of the beautiful Field Study fabrics by Alice Kennedy for Timeless Treasures. I think both the plaid multi and diamonds multi prints would make fabulous bindings and I'd love to back a quilt with those flowy white flowers of the Floral Mist print. I think what makes this collection extra special for me is the hand-drawn quality. The giveaway is open to everyone, all you have to do is leave a comment on this post for your entry. Like Sew Sisters on Facebook, then come back and leave a second comment saying you did for another chance. I will draw a random winner on Wednesday, August 6th at 6:00 p.m. PST. Good luck! ETA: comments are now closed, thanks for entering! Love this shop!! Thanks for the heads up! I LIKE...a lot! Thanks for the chance! Well done on being partnered up with a great looking quilt shop and what lovely fabrics - we just don't get anything like this around here ...... our local shop with some quilty fabrics cuts fabric on the floor with scissors. Need I say any more. Fabulous shop and this is a great giveaway! I actually have some Floral Mist ready to use for a quilt back, and it is spectacular. Thanks for the chance. I do follow Sew Sisters on Facebook. I follow sew sisters on db. .great Shop! Thanks for the informtion, will definitely check them out! Would love a chance to win a fat quarter bundle of the lovely Field Study collection. I "liked" Sew Sisters on facebook. Looking forward to lots of quilting information from them. I am a big Sew-Sisters fan too - I was lucky enough to visit the shop this summer when I was back in ON visiting my folks. And I am a fan on FB too. Hi,I follow Sew Sisters on FB. I've ordered from Sew Sisters before and have always been very satisfied. it's nice to have a Canadian online quilt shop that provides quality products and great service. I love this new line-- the birds are beautiful! Oh that field study is lovely! Love the shop motto, I love a good deal on shipping! Birds are my friend. Nice. I like Sew Sisters on Facebook. Thanks! Thanks for a chance to win these fabrics. Coming back to say I did!!! What a delightful shop, and a great partner for your lovely blog! Thanks for the chance to win this awesome fabric. I love the birds! Yay! Thanks Krista and Sew Sisters!! The birds are very cool! Thanks for the giveaway! Liked on Facebook too ☺️. Happy Friday everyone! Great collection of fabric. Thanks for the giveaway. I follow Sew Sisters on Facebook. Great to see you are partnering with Sew Sisters...you are both awesome! I follow Sew Sisters on facebook. love the shop. I love Sew Sisters and try to go every time I am in Toronto. Thanks for the giveaway! And I follow Sew Sisters on Facebook too! I 'like' Sew Sisters on FB, too. Fun fabric, thanks for the chance. beautiful little bundle, thanks for the chance to win! I follow Sew Sisters on FB already. Love the shop and I get my FQ's of solids monthly from them. I love SewSisters and their fabric! I love the bright diamonds and the birds. Either would make a great cheater top for a small quilt. LIKE 'SEW SISTERS QUILT SHOP' ON FB! Great giveaway. Love the shop too. Congrats on having a sponsor! I love that bird print and the rainbow sketch makes me really happy. Have a great weekend. I like them on FB :) Great giveaway!!! That bird print is so pretty! I follow Sew Sisters on Facebook! I'm following you on Bloglovin! Thanks for the giveaway. I like and follow Sew Sisters on Facebook. I love the bird print and the flowers! love the shop! What a great selection of fabrics! Canada eh? ;-) Thanks for the chance to win! Generous giveaway and lovely fabrics. Thanks for the chance. Beautiful fabric. I follow sew sisters on line and I love their shop!! I like Sew Sisters on facebook. Thanks for the chance to win some lovely fabrics. Already liking Sew Sisters on FB. Thanks again. I've been eyeing this collection for a while! I've had the great pleasure of visiting the Sew Sister's shop. I already like Sew Sisters on FB. Great shop! Already 'Like' Sew Sisters (as Stitching Happily). Thanks! Yay for finding a great local quilt store. And by local I mean in the same country! Thanks for introducing me to this shop. I've never heard of it but glad to hear it's Canadian and postage is reasonable! What a wonderful giveaway....lovely shop! I do like them on FB! Well that upped the comment count!! Thanks for the opportunity to you and Sew Sisters!! So nice to learn about a Canadian shop. I'll be checking them out asap. Thanks for the chance to win such a pretty bundle. And, I now follow Sew Sisters on facebook. What a fantastic bundle. I could do so many things with these great prints. I am a friend on FB and I love the fabric. The birds are so cute. Love the fabric thanks for the giveaway. This is a great shop and I can even say I have been there in person! SSew Sisters is my favorite online shop in Canada!!!! They are very helpful and friendly...plus you can't beat their postage rates!!! I already like Sew Sisters Facebook page!!! Thanks for another chance to win this sweet bundle!!! Your so right about their shipping being reasonable, and their one of the few Canadian shops to boot! I love Sew Sisters selection. I like Sew Sisters on facebook ! Just looking at the fabric line again and am in love with the Colors and prints, wonderful stuff!! Thank you for the opportunity and for sharing. Looking back I love the Selvage Colour Block Tutorial in March of this year....I've been saving those for my "Sewing sister" to make her a selvage quilt. I liked on Facebook--look forward to the chance to enter the draw! Beautiful fabric, I agree the diamonds would be a fab binding! I liked sew sisters on fb too! Pretty bundle of fabric, thank you for having a giveaway. Beautiful fabric! thanks for the chance! Beautiful fabric combination. Thanks for the chance. I liked Sew Sisters on FB. Thank you. I love that this shop is in Canada. Thanks! What a wonderful bundle, thanks for the give away! Beautiful fabrics! I can see some great uses for these. This is a gorgeous bundle of fabric! Thanks for the chance to win some! I'm already a follower of Sew Sisters on FB! Love the bundle! Thanks for the giveaway. I love these fabrics, especially the songbirds print - so pretty! I follow them on Facebook - but did not know about their Fcebook giveaways. Thanks for the tip! nice shop, love the selection. Thanks. They have such a great shop. I already "like" Sew Sisters on FB. I like Sew Sisters Quilt Shop on FB as Kathy Newsom Davis. Those diamonds are so fun! What great fabric! Thanks for the chance to win some. Sew Sisters looks like a great shop. I "like" Sew Sisters on FB. I have bought from Sew Sisters a few times. I have always been pleased with their product and they give great service. Thanks for hosting such a nice giveaway. I also follow them on facebook- it is a great way to keep track of what they are doing in their shop. Love this cute fabric. I also love sew sisters. They are excellent to deal with a good partnership for poppy print. I love the birds. Thanks for the chance. I like Sew Sisters on FB. Thanks for the chance to win! Sew Sisters is an awesome shop! Great shop and giveaway. Thanks. Gorgeous colours; love them! Thank you so much for the chance to win this; good luck to everyone! Just love those prints - especially the colorful birds! Thanks for the giveaway. I love the plaid print. My gosh, the bird & flower prints are so great!!! What a fun collection! How nice to find a shop that doesn't gouge on postage. That's one of the things I always check before ordering, especially as I'm overseas. Great fabrics. Good to know about a Canadian online store. Thanks for sharing and for the chance to win!! And thanks for a way to participate...even tho I do not do Facebook...appreciate the chance! Love this gorgeous fabric bundle. Thanks for the giveaway opportunity! I had seen this fabric before, it's wonderful! What great taste! What gorgeous fabrics. Thanks for the lovely giveaway.